Is it a good thing to know something about the composer whose music you are hearing? Ludmila Berlinskaya says: “It’s always important to know as much as possible about the composer you play”. I can fully understand why that might be for the performer and how they go about realising the composer’s intentions, but is it true for the listener? One could argue that the opposite could be the case. A piece of music is an artefact which has an existence independent of its composer, especially if the details of his or her life are obscured by the passage of time. Should a listener’s response to music be conditioned by what they know about them, or how much they sympathise with their beliefs or lifestyle? The anti-Semitic remarks of Wagner invite antipathy; on the other hand, the sad details of Schubert’s sometimes pitiable life might have the opposite effect. Are these considerations relevant to musical appreciation? Most people, when remarking on the beauty of a finely worked table, would probably not enquire into the beliefs and lifestyle of the carpenter. Why should a piece of music be different? The question is all the more relevant when the composer is Scriabin. Suppose that, before hearing a note of his music, one came across Scriabin’s less comprehensible (at least to me) utterances. For example: “In love's godlike breathing, there's the innermost aspect of the universe.” Or perhaps: “I am a moment illuminating eternity ... I am affirmation ... I am ecstasy.” A listener allergic to this sort of pronouncement might reasonably wonder whether it would be worth proceeding. Conversely, one with a taste for the mystic might be drawn to the composer and perhaps read all sorts of things into the music. Yevgeny Sudbin – my usual reference for the way Scriabin should be played – has written: “Oh how easy it is to become possessed by Scriabin, one of the most enigmatic and controversial artistic personalities of all time. Once one is bitten and the venom, in the form of his sound-world, enters the body and soul, the effects become all-encompassing, even life-threatening!” He’s right; it’s the sound-world that’s important. Ideally, I try to listen and respond to the music as if I knew nothing about the man or his writings. In practice, I don’t find that so difficult; statements like those above don’t mean a thing to me anyway. What I am looking for in the ideal Scriabin interpreter is the ability to realise the composer’s multifarious – and often invented – verbal instructions. Alert and delicate finger-work and an extreme variety of touch are required, together with imaginative pedalling; Scriabin was renowned for an original and subtle technique on the pedals. Then there is a need to make coherent sense of the sometimes bewildering showers of notes, or conversely, sparse and delicate lines. 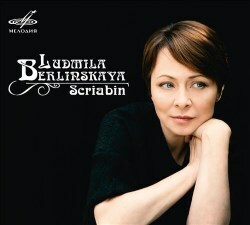 On the evidence of this CD, Ludmila Berlinskaya joins Sudbin at the very top of the list of my great Scriabin interpreters. While there are many good performances available, particularly of the sonatas, Berlinskaya has something extra, really getting to the heart of the music. She has the technique and imagination to realise the incredible variety of textures, from the delicate filigree of Enigme to the dense, smoky quality of the Ninth Sonata, to which she brings intense energy when needed, matching Sudbin in that respect. Like many others, Maria Lettberg’s intelligent performance on her complete Scriabin set is somewhat underpowered in comparison. This is true also in the Fourth Sonata, where Berlinskaya’s scrupulous observation of the rests and pointing up of the rhythms in the Volando section really make the music fly. Some performances skate over the surface here and miss the effect. The three or so minutes of the Poème Op.32 No.1 provide ample scope for comparison between interpretations. These can vary enormously, from the somewhat strait-laced – Lettberg, Oleg Marshev, Guy Jonson – to the languorous – Anatol Ugorski, Yuja Wang and Sophia Lisovska. It seems to me obvious from the harmonies and the way the polyrhythms lie that the latter approach is right. Berlinskaya moves it along a bit more than some but, as she does across the whole CD, it doesn’t feel fast as she is subtly free with the rhythm. This accords with what is known about Scriabin’s own playing; well, sometimes I can’t forget about the man himself. Tiny variations in the semiquaver runs demonstrate her attention to detail. It’s a pity that the whole of the Op.11 Preludes aren’t on this CD but the ten that appear are finely played as are the slices of imagery from Scriabin’s later years. Nuances flows better in Sudbin’s faster version but I like Berlinskaya’s slightly reticent approach. In Enigme, she matches the superfine filigree of Arcadi Volodos, another terrific Scriabin interpreter. The extended crescendo of Vers la Flamme receives a finely controlled performance. Though one might have preferred the disc to have been filled with Scriabin, the couple of preludes by Boris Pasternak – in his pre-novelist musical career – are skilfully wrought and well worth hearing. While the influence of Scriabin is obvious in these, and in the preludes by his son Julian - their authorship has been questioned - they are distinctive enough to merit a recording. People may play Scriabin in many different ways, not necessarily following the example of his own playing style. Ludmila Berlinskaya takes a flexible, even extreme, approach, rhythmically free and dynamically contrasted. While this could lead to an undisciplined muddle, in her hands it doesn’t. While the result is always poetic, the works retain their structural integrity.